If you thought diamonds were a confusing topic, since you have color and clarity to consider, you haven’t ventured into the world of diamond simulants, yet. There are mined diamonds, lab-created diamonds and simulants. The categories can be incredibly confusing, so here we’ll focus on simulants and the difference between Asha and Diamond Nexus simulants in particular. First, What Is A Diamond Simulant? First, you might be wondering what is a simulant. A simulant is a material that looks like diamond but does not have the physical properties of a diamond. 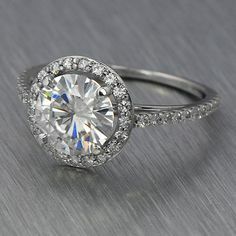 They can be natural like quartz or white sapphire, or man-made like cubic zirconia or moissanite. Many simulants are cubic zirconia while not admitting that they are CZ. While cubic zirconia is man-made, that does not mean it’s a synthetic diamond. Diamond substitutes like simulants are a great alternative for people who don’t have the budget for a real diamond. They look exactly like a real diamond, and only jewelers and experts can tell the difference between simulants and mined diamonds. An Asha simulant is a material that looks like diamond. It’s a material that is in the same family as cubic zirconia, but it has an added layer to protect it. That layer is composed of the same atoms that are found in a natural diamond. They’re designed to be as close as possible to a real diamond. The added upper layer gives the simulant sparkle and brilliance that can easily make it appear to be an actual diamond. With the amorphous diamond treatment over the Asha simulant, it elevates the material to a Mohs hardness scale rating of 9.6 to 9.8, which is only slightly less than a diamond’s 10 rating. This makes it incredibly durable and scratch resistant. A cubic zirconia is porous, which allows dirt, skin and oils to penetrate the surface. This makes them become dull, dirty and cloudy over time. The treatment on the Asha simulant creates a non-porous layer that reduces the ability of contaminants to penetrate the surface. The Asha diamond will remain the same beautiful, sparkling stone it was when first purchased. Take a look at this video, featuring an Asha simulant and you will see just how close to a diamond this simulant appears. A Nexus diamond simulant is a material that is created in a lab but that doesn’t have the same chemical makeup of a lab-created diamond. It should be very clear that Nexus diamonds are not lab-created diamonds. They’re cubic zirconia, which can still be incredibly beautiful and a great replacement for a high-priced diamond. The Nexus simulant costs less than a cubic zirconia of the same size. It has a hardness of 9.1 compared to CZ’s hardness, which is an 8.5 on the Mohs scale. A Nexus simulant doesn’t have the coating that’s available in the Asha simulant, but the proprietary simulant has the ability to stay clear and sparkling for years. Diamond Nexus Labs was started in 2004. It’s located in Wisconsin and talks about their strong committment to ethically-sourced metals used in their jewelry. Their jewelry does not include nickel as an alloy. Nexus Labs has a variety of colors in their fancy simulant diamond category. It includes glacial ice, champagne, light pink, deep brown and canary yellow. Take a look at this video showing off the sparkle of Nexus simulants. Its almost impossible for the average person to distinguish between these simulants, and actual diamonds. The added layer of carbon atom on the Asha simulant leads many to believe that it’s a superior option to Nexus diamonds. Since cubic zirconia has the tendency to pit and gather oils over time, it can become cloudy and dirty. This doesn’t happen to Asha simulants because they have the proprietary diamond treatment that leaves the surface as smooth as a diamond. Nexus and Asha simulants have the added bonus of being conflict-free. Mined diamonds are often obtained through mining practices that tainted with human rights violations or environmental concerns. That’s never true with simulants, which are created in a lab environment. With the coating on an Asha simulant, the appearance of the gem will look more like a diamond than the Nexus alternative. 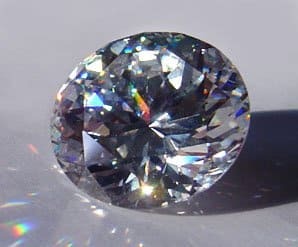 A CZ has less white light return, a bluish cast and less realistic diamond appearance than one like Asha that is covered with a diamond coating. The coating filters out the blue cast as well as providing more fire and brilliance than a CZ alternative. 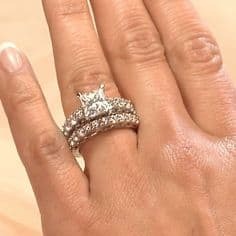 You’ll need to decide whether you want a simulant or a synthetic diamond ring. Before purchasing an Asha or Nexus diamond, it’s vital that you make sure the company has guarantees or warranties in place in case the ring becomes damaged. They can become cloudy over time, and you want to be able to return a ring that doesn’t look its best. All cubic zirconia stones are not the same. Some have coatings like the Asha simulants while others have a variety of ingredients that will change the chemical makeup of the stone. You’ll have to find one that you love based on how it looks, guarantees of the company, and whether it falls within your budget.